Imagine visiting your local doctor with a severe illness and worsening cough. When the laboratory test results come back confirming you have tuberculosis – do you wonder if they are accurate? For many people living in Africa, this is an honest question and depends on the quality of the laboratory. In many communities throughout the continent, you may never know if your results were entirely accurate. Mozambique, however, no longer has that worry; the National TB Reference Laboratory (NRTL) was recently accredited to international standards, and there is much reason to celebrate. 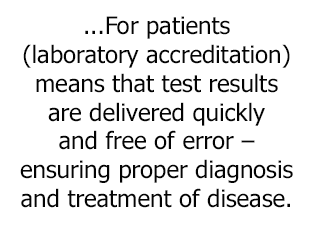 Laboratory accreditation may seem unimportant at first glance, but for patients it means that test results are delivered quickly and free of error – ensuring proper diagnosis and treatment of disease. For the broader community and health system, accreditation provides a guarantee of quality. Accredited laboratories can efficiently and reliably identify emerging diseases such as Ebola, monitor outbreaks, address drug resistance, and maintain the frontlines of an increasingly important global health security agenda. For the NTRL in Mozambique, the accreditation process began in 2011 with support from the ASLM-implemented SLIPTA programme. SLIPTA is a stepwise quality improvement programme which guides laboratories towards accreditation through a World Health Organization-endorsed framework of audits and evaluations. ASLM awards audited laboratories a star-rating (zero to five stars) and provides assistance for corrective measures and improvement plans. Beyond SLIPTA, the NTRL also participated in other quality improvement programmes such as SLMTA. SLMTA is the Strengthening Laboratory Management Toward Accreditation (SLMTA), a structured programme that teaches laboratory managers how to implement practical quality management systems in resource-limited settings using available resources. “The accreditation of the TB laboratory represents a great value to local physicians and our patients. This success allows us to improve local capacity for diagnosis, particularly in cases of tuberculosis drug resistance, while also providing credibility to the research being conducted locally,” confirms Dr. Elisabeth Nunes, a local physician and Head of the Pneumology Department in Maputo Central Hospital, the biggest and more specialised public hospital in Mozambique. The National TB Reference Laboratory (NTRL) of Mozambique was accredited by IPAC for three tuberculosis assays (testing mechanisms): 1) fluorescence microscopy, 2) solid and 3) liquidmycobacterial culture. The accreditation is based on ISO 15189:2007 and recognises the excellence of technical and management systems within the laboratory. Peter T., Rotz, P., et al. 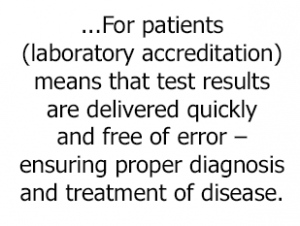 Impact of Laboratory Accreditation on Patient Care and the Health System. Am J Clin Pathol. 2010; 134: 550-555.